The Canadian Armed Forces (CAF) prides itself on being ready. Operational plans are always in the works to meet the need of the day, and this planning process is an endless endeavour where options are devised for all manner of contingencies in this unpredictable world. So it will be no surprise that a committed Defence team has been advancing work to make one particular aspect of operations and mission execution better, and that is the creation of a Joint Targeting enterprise. The new Joint Targeting enterprise will be underpinned with proven military concepts and doctrine such as the Joint Targeting Cycle. Those who are familiar know that the Joint Targeting Cycle relies on solid information and intelligence. In this digital age, there is useful intelligence buried in the vast data lakes being generated every moment of each day. In the establishment of a Joint Targeting enterprise there exists a very real opportunity to innovate by integrating the tried and true targeting methods with significant capabilities in data sciences and artificial intelligence, specifically the use of big data and machine learning. The Canadian Armed Forces are well-practiced and reliable at delivering traditional kinetic effects with munitions at the sharp end of the force. But today munitions alone are not always suitable, or enough. More and more often a non-kinetic effect, such as an influence campaign or a cyber activity, may be a more desirable option either as stand-alone action or in combination with traditional munitions options. We’ve witnessed such non-munitions effects employed in the annexation of Crimea by Russian. Russia used a combination of traditional ground troop movement, cyber methods and information operations to shape international perceptions and influence its adversaries. While the world is unpredictable from a geopolitical perspective, theatres of operations are also more complex than ever because of the unrelenting propagation of data and communications technologies and how they enable adversaries. It is well accepted now that these technologies can make it difficult to resolve an operational picture and take action, but what is less known is how these very same technologies also offer the opportunity to find and stay one step ahead. As a Joint Targeting capability is systematically established, the Defence Science and Technology community is poised to ensure big data and machine learning algorithms provide the CAF with non-munitions options and valuable data mining tools for intelligence production. Big data refers to the volume, velocity or variety of data that is diverse, fast-changing and typically too big for conventional analytic means to make any real sense of it. Big data comes in almost any type of structured or unstructured format: geospatial, audio, video, text and anything posted in social media, for example. Big data is collected and saved in the cloud by personal mobile devices, satellites and remote sensors, software logs, cameras, microphones, radio-frequency identification (RFID) readers and wireless sensor networks, to name some. Whether you are going to the grocery store, streaming a movie or out for a bike ride, virtually every activity and query creates recordable data. Those kinds of details saved in massive data lakes mean that there are endless possibilities when posing questions and seeking answers. As the Economist noted recently, Alphabet (Google), Amazon, Apple, Facebook and Microsoft all deal in data. In this digital age, data is the number one commodity, not oil. In terms of Joint Targeting, what do we want out of these data lakes? What we want is an ability to trace kernels of information and reveal hidden patterns, particularly those relating to human behaviour and interactions. The business world does this with machine learning algorithms, and the same science and technology could be adopted to facilitate a targeting process. Artificial intelligence has brought us computers that can beat us at a game of chess, process human speech and read handwriting. But there has been even more impressive progress in the past few years in the artificial intelligence subfield that we have already begun discussing – machine learning. Machine learning algorithms help computers map rules and find loose connections by themselves without having to be expressly programmed by a human and are the key to uncovering the buried information in big data that leads to useful intelligence. With machine learning, computers can predict when a situation is coming to head in a foreign land, predict weather systems on a continental scale, and scour all available medical literature to uncover cancer treatments for more obscure forms of that disease. The real beauty of machine learning is that the more data accessed by a machine learning system, the more it learns to do its job better. Freed from the finite capacity of the human mind, machine learning is able to discover the patterns buried in the big data that can be useful to a Joint Targeting Cycle. The Canadian Armed Forces’ and NATO definition of targeting is: The process of selecting and prioritizing targets and matching the appropriate response to them, taking into account operational requirements and capabilities. Simply put, a target can be a person, place or thing. The targeting cycle is often presented as iterative – analyzing and prioritizing munitions and non-munitions capabilities against targets – and consists of six major steps: (1) end state and commander’s objectives, (2) target development and prioritizing, (3) capabilities analysis, (4) commander’s decision and force assignment, (5) mission planning and force execution, and (6) assessment. Each of these steps is driven by subject matter experts, intelligence analysts and operational planners. As a team, they execute the targeting cycle as efficiently and precisely as possible. Today’s warfare brings with it significant challenges in detecting, identifying, tracking, and engaging targets due to the increased data flow, the sophistication of adversaries in concealing the data, and the speed of conflict. The expression, “time is of the essence” has never been more true. In today’s operational theatres where our adversaries blend in with the local population, they hold an advantage by only being able to only briefly expose themselves to large-scale military operations. The momentary need for exposure, often prompted by the need to communicate, occurs in an instant. When adversaries take advantage of the ease of lightning speed of communications, they leave a trace. Bread crumbs can be followed, dots can be connected, and machine learning algorithms is the way to do it. Recent operations have demonstrated the pressures and benefits that data science can bring to the Canadian Armed Forces Joint Targeting process. Whether analyzing maritime targets while in command of Operation Enduring Freedom’s Combined Task Force 150 or providing targeting solutions for Operation IMPACT and the global coalition against ISIL, we can begin to mitigate human bias and our finite intellectual capacity by leveraging the exponential growth and availability of data. Denying terrorists the use of the sea to transport drugs or denying ISIL the revenue from oil production is complicated military business. Relationships, money, and communications methods all play a role in these kinds of networks, and machine learning on big data can make the connections. So far we have discussed Joint Targeting for the CAF as something new and a clean slate to take advantage of, but that is not entirely accurate. The CAF constantly seeks to improve itself and so for several years has been implementing concepts and ideas that turn out to be strong starting points for a Joint Targeting enterprise. In 2009, the Canadian Forces Integrated Command Centre (CFICC) was established for the operational commands that were transitioned into the Canadian Joint Operations Command (CJOC). The Integrated Command Centre provides an operations watch floor focused on supporting all of Canada’s domestic and international missions twenty-four hours a day. It is highly connected, houses a robust intelligence staff, a geospatial intelligence capability and the headquarters of Canadian Special Operations Forces Command (CANSOFCOM). 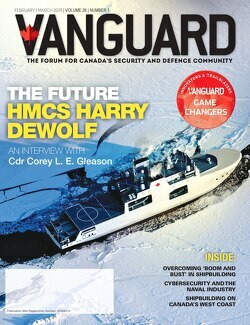 The emphasis is on “integrated” and it is here that the Canadian Armed Forces have been melding intelligence production and operations watches, enhancing information sharing, and nurturing the kind of culture and center of gravity that is quite informative when designing a Joint Targeting Enterprise. Similarly, the Joint Information Intelligence Fusion Centre (JIIFC) has led the way in providing timely and agile command and control solutions to the Canadian Armed Forces. Successful innovations have included a fused, multilayered Command View of all missions and operations, a near-real-time strategic common operations picture and a safe and reliable classified data transfer capability. All these tools have aided in strategic decision making for over ten years. Now with the intentions of standing up a recognized Joint Targeting enterprise, JIIFC has a central role as the coordination lead for Joint Targeting automation on Canadian Armed Forces classified networks. The concept of operations and intelligence integration under one roof supported by data, information and intelligence fusion capabilities is the second point of strength for the standing up of a Joint Targeting capability in the digital age. Looking at Canadian intelligence concepts developed for forward deployed forces, Afghanistan was the operational catalyst that led to an All Source Intelligence Centre (ASIC). In 2016, the CAF set up an ASIC as a part of Operation Impact, responsible for collecting, synthesizing, and analyzing information derived from a variety of sources. Now the intelligence being gathered from ASIC is being used to inform operational planning, ultimately contributing to the protection of coalition forces and the conduct of coalition operations. Google, Facebook and Amazon all use data and machine learning algorithms to provide billions of dollars in revenue. The Economist states, “Google can see what people search for, Facebook what they share, Amazon what they buy.” This “God’s eye view” of activities in the consumer markets of the world is powerful. They know what you want to buy before you are aware of your own need. In a similar fashion, machine learning allows for faster and more accurate targeting. It assists in detecting, identifying, tracking, and determining the best combination of munition and non-munitions effects for a target. For example, is that terrorist in the compound with women and children or on patrol? It is this kind of value, and much more, that data sciences embedded in a Joint Targeting enterprise can benefit from. In establishing a permanent Joint Targeting capability, the Canadian Armed Forces can innovate from the outset and leverage the technological advances and opportunity that big data and machine learning can offer. Embracing the digital age for a modern, digitally enabled Joint Targeting enterprise will make a qualified contribution to Canadian Armed Forces operations, and the Defence Science and Technology community is taking steps to make it happen. Dan Landry is a defence science programme manager responsible for the emergent Joint Targeting portfolio at DND’s ADM Science and Technology. He is also a retired naval officer, mariner, oceanographer and C4ISR leader.